Remembered on the Muston War Memorial, St John The Baptist Church Yard, Muston and the Tyne Cot Memorial, Flanders. Courtesy of the Grantham Journal. William Pollard Kirton was born in 1897 in Edwalton, Nottingham. William was the son of Mary Ann Kirton. Mary married Arthur Smith in 1897. 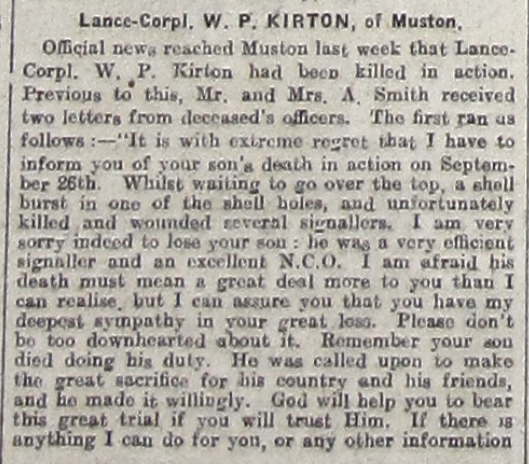 By 1901 the couple were living on Woolsthorpe Road Muston with William Smith aged 4 (known as William Pollard Kirton). Arthur Smith worked as a shepherd. In 1911 the Smiths were still living in Muston. Arthur was now working as a railway platelayer. Aged 14, William was a messenger in the commercial department for a railway company – most likely the Great Northern Railway which ran through Bottesford. By the time of his enlistment aged 19 years, on the 25th November 1915, William Kirton was a warehousemen for a clothing company. He lived in Ella Road, West Bridgford, Nottingham. 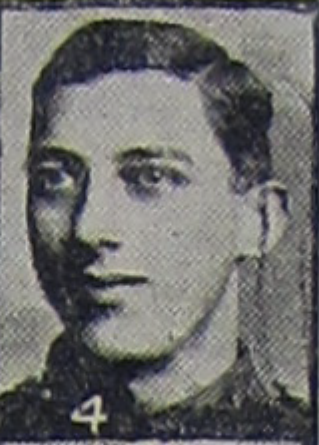 William joined the 2/5th Battalion, Sherwood Foresters. At 5’ 10 ¾” he was tall in comparison to the average recruit height of 5’4”. In November 1915 his Battalion became part of the 176th Brigade, 59th (2nd North Midland) Division located in Watford. With the strategic withdrawal of German Forces east from the Somme, the 59th Division was tasked with pursuing them. The lack of training began to be felt in the difficult situation of advance and counter attack especially at Le Verguier where they lost over 100 men in April. Further attacks and counter attacks in May resulted in a further 150 men who were either killed, wounded or missing. On the 20th September 1917, the Division’s role was to relieve the 55th (West Lancashire) Division after it had made an attack in the area of Gravenstafel. Assembling around Goldfish Chateau, just outside Ypres, the Division moved into the salient on the night of 23/24th September and took their battle positions during 25th and 26th. The Division attacked as part of the British force that made an assault early on 26 September. 2.10 am Companies reported to be in position for attack. The post engagement report describe what happened in more detail. (…) At 4.00 a.m. In reply to our preliminary bombardment, the enemy put down a heavy barrage and ‘D’ and ‘A’ Company suffered considerable casualties. 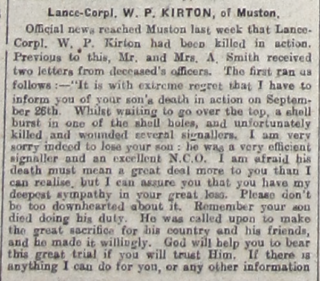 William Kirton was with ‘B’ Company who were immediately behind ‘D’ Company. The Battalion was using shell holes as their front line defense. During the bombardment on German positions William was “waiting to go over the top, a shell burst in one of the shell holes” where he and three other signallers were waiting. He and another signaller were killed instantly and two others were injured. Over the next three days the Division suffered 2000 casualties before being relieved on the 29th September 1917. 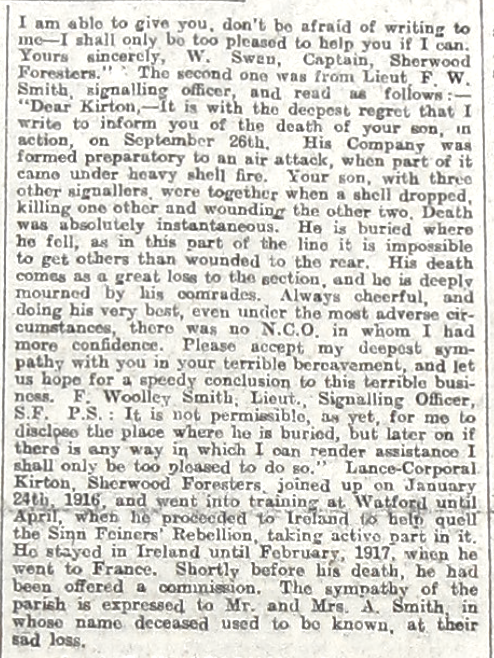 Four months after his promotion within the ranks he was offered a commission as an officer. Sadly he was killed before he had the opportunity to take on that role. 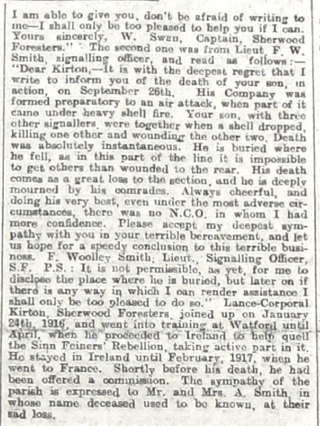 Lieutenant Woolley Smith wrote to his parents to let them know that William “was buried where he fell, as in this part of the line it is impossible to get other than the wounded to the rear.” William’s grave was lost during the subsequent conflict. He is ‘remembered with honour’ on the Tyne Cot Memorial. 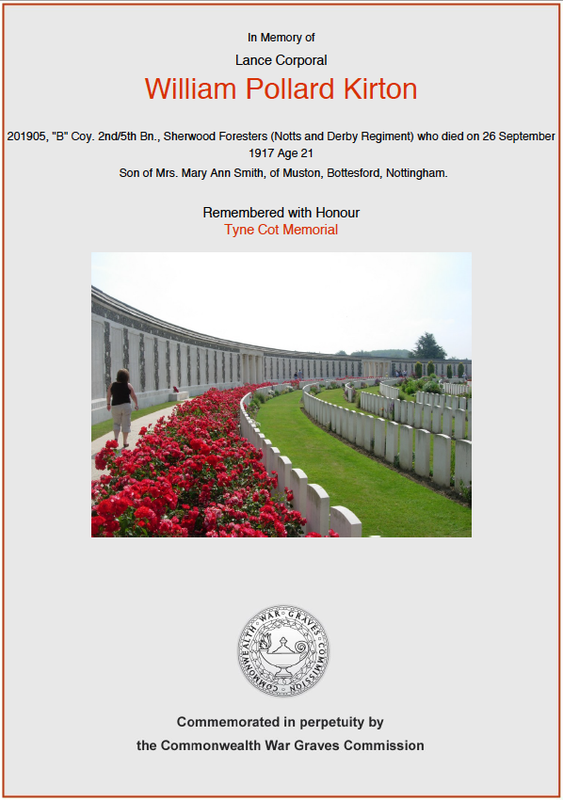 The 2/5th Battalion Sherwood Foresters lost over 600 men on the 21st March 1918. They were either killed, wounded, captured or missing on the first day of the German Spring Offensive. Four men from William Kirton’s Battalion “survived” to answer the roll call.